Having a garden is a wonderful source of fresh vegetables during the summer. You can also enjoy fresh-cut flowers freely. Unfortunately, your garden doesn't just supply food and enjoyment for you, but it also provides food for a wide assortment of insects. To battle the little pests, you can buy insecticides, but many have side effects that people wish to avoid. You can create "all natural" pesticides, but those will still kill good insects as well as the bad. Rather than spraying any kind of poison on your plants, the best way to keep many of your unwanted pests under control is through the use of ladybugs. They are friendly insects that even children love. Why ladybugs are so beneficial in any garden. Garden Insects states that ladybugs are great for eating all kinds of garden pests. The main food for these beetles are aphids, mealy bugs, mites and other soft-bodied insects. According to Garden Insects, a ladybug might eat 5,000 aphids during its lifetime. If you have enough of them in your garden, you could rid your garden of aphids and other insects without the use of chemical pesticides. Since the adult ladybugs' diet is comprised of pollen as well, this little beetle will help pollinate your plants. If you have plenty of aphids, mealy bugs, scales, mites and leaf hoppers but don't have any ladybugs, then you need to get them to your garden. With all the insects, Gardening Know How states that you have half of what the ladybugs want. You now need to get pollen that's attractive to them into your garden. Ladybugs really like the pollen and leaf shapes on angelica, marigold, statice, sweet alyssum and yarrow. Apartment Therapy recommends placing out water in shallow dishes so the ladybugs have plenty to drink. If you feel that you can't take the time to attract the ladybugs to your area, you can purchase them and release them into your garden. According to Buglogical Control Systems, if you choose to do this, the best way to ensure that they remain is to refrigerate them first so that they are moving slowly. Refrigerating them imitates their own hibernating process. Once you release them, be sure to do so at dusk and in a well-watered area. Buglogical also states that you should spread the ladybugs out so that they aren't all in one spot trying to feed. You want to make sure that plenty of food exists for your tiny friends. A word of caution, though, is given by Treehugger. A large amount of common ladybugs are harvested from the wild and can carry parasites that are bad for native ladybug populations. 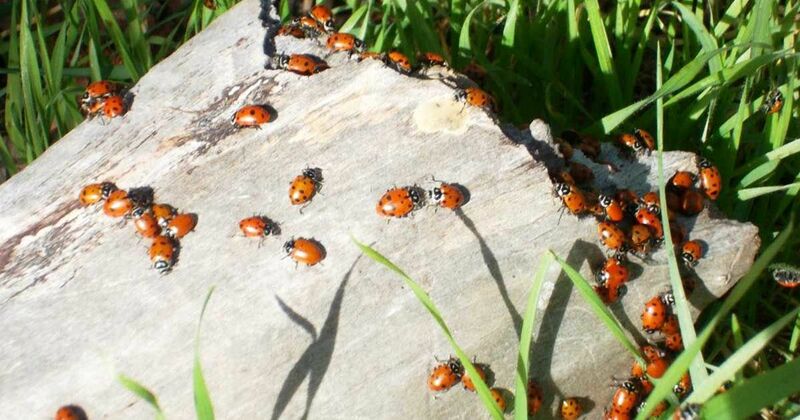 Treehugger shares that you can get farmed ladybugs from BioBest and Insectlore. This will keep you from getting contaminated ladybugs. The best option is just to attract them if you can afford the time. Gardening Know How states that ladybugs appear to be attracted to plants that have wide petals and white and yellow flowers. Since the adult ladybug's diet is made up of both pollen and aphids, having plants they like is just as important as the bugs they will eat. Besides the ones mentioned above, ladybugs seem to like calendula, caraway, chives, cilantro, cosmos, dill, fennel and feverfew. Balcony Garden Web gives a list of 26 plants that attract ladybugs, but some of the top winners are garlic, bachelor's button, parsley, Queen Anne's Lace, butterfly weed, dandelion and mint. Plant a few inviting plants for the ladybugs and maybe even a few to attract the insects they eat. This might keep the insects away from what you really want saved and can ensure that you have plenty of these friendly little beetles around to do your work.